"We couldn't have dreamt of a more amazing ceremony it was full of depth and meaning. It gave our guests an insight as to how we are as a couple and what we believe. David captivated our guests with his words - it was truly magick. Thank you so much for helping us make our wedding memorable by all". AN EARTH-CENTRED - CELTIC HANDFASTING. In some ways, a handfasting is much like a typical marriage. 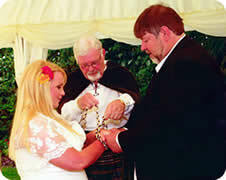 Handfasting, following the Celtic tradition, is a betrothal or wedding ritual. The couple's clasped hands are draped with a cord or ribbon. The couple, with the Celebrant, gather with friends and family. They exchange vows and usually rings. Often there will be bridesmaids and friends assisting in the ceremony. A unique ritual will be written, which reflects your desires and aspirations. You will be provided with a ceremony dreams are made of. David will be delighted to discuss your personal dream - he will write a bespoke ceremony reflecting your belief system, your personalities and your character. Usually a Handfasting will be held in as natural a setting as possible - amongst nature and the elements. The space may be decorated with flowers and foliage of the season and lit with candles in lanterns. The smell of sage and frankincense fill the air. It is a space that is honoured and made sacred to the Elements of nature. The ceremony is presided over by David who adheres to Earth based traditions, believing in the forces of Nature and the Universe. The couple are invited into the sacred space and the ceremony is conducted. 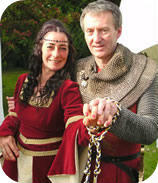 David will provide a beautiful and memorable Handfasting ceremony. It will be something you, your friends and your family will talk about for months. Assistance of a Priestess and/or Quarters at cardinal directions can easily be arranged. 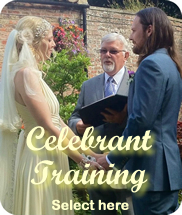 David has celebrants that, if required, are available to assist him at ceremonies. The ceremony is romantic, spiritual and entwined in love, celebrating the love between two people and preparing them for their future together. But the day is also a celebration of family and friends coming together to wish a couple well. Flowers, music & food - fun for all! With this in mind we offer three choices of Handfasting. A betrothal of a year and a day. The cords may be loosely tied symbolizing that the handfasting is a commitment, but one that is not an onerous one. This is a beautiful 'earth-centred' ceremony clearly focused on nature. One year and a day after being handfasted, the couple may return to the celebrant and repeat their vows with the cords or ribbons tightly knotted to make the commitment binding. This symbolizes the intent to have a permanent relationship. This ritual is the source of the expression "to tie the knot." Sometimes a couple prefer a Traditional Wedding Ceremony and include a handfasting as part of their ceremony - immediately after saying their vows. This is becoming increasingly popular in traditional wedding celebration ceremonies. According to Celtic Spirituality, God is found in all things, not only the human heart, but also in all of God's creations. The elements of Earth, Fire, Air and Water are called upon to cast blessings upon the couple. The ritual is designed to enable us to get in touch with the life force within ourselves, to sense an interconnectedness with all life, and to access the energies of the living earth. Handfastings are conducted in a circle, which is a symbol of eternity - a sign that life, love and happiness have no beginning and no end. All who enter the circle must do so in perfect love and keep sacred the ceremonial space. Stacie & Chris from USA - within the Circle of Stones at Stonehenge. "David, Just got the family around last night to watch the video. We were very pleased! The sound quality was fantastic and the shot was lined up perfectly! Thanks again so much for performing the ceremony. We couldn't have picked a better celebrant or location". Excellent communication with Bride and Groom. 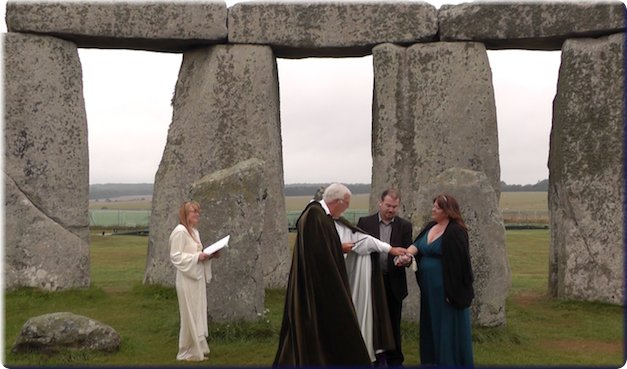 A superb personalised Ceremony, including a traditional Celtic Hand Fasting. Ginny and I just wanted to let you know how grateful we are for your involvement in our special day. We would like to thank you for your warmth, enthusiasm, flexibility and professionalism.